Posted 3:47 pm by Administrator & filed under News. 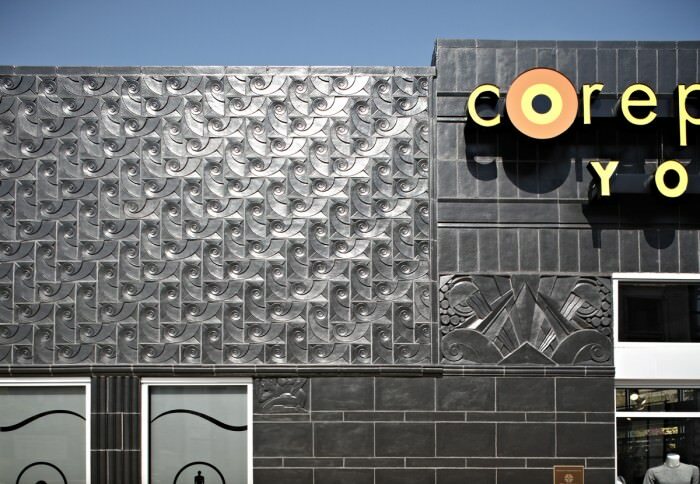 CorePower Yoga recently opened its ninth Chicago-area studio at 3232 N. Lincoln Avenue in Chicago’s Roscoe Village neighborhood. The Denver-based provider of yoga classes and lifestyle programs chose a circa 1930’s historic structure with Art Moderne features for its 54th location nationwide. In designing schematic elevations for the rehabilitated building on behalf of Tartan Realty Group, Hartshorne Plunkard Architecture created a strong storefront presence within a historically appropriate treatment of the building. Long vacant, the building had an exterior partially covered in metal panelling, dryvit, and vestiges of signage and awnings from previous tenants. The cladding additions were carefully removed and the terra cotta underneath was restored. Restoration plans were coordinated with the City of Chicago Landmarks Department because the building is denoted an Orange Rated structure with potentially significant architectural or historic features.